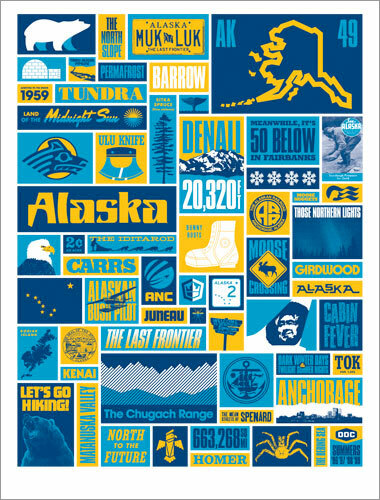 Draplin Design Co.: DDC-041 "DDC vs. Alaska Poster"
01. Sprucing up that house, home, apartment, quonset hut, igloo, lean-to or jail cell. 02. Bringing some Alaska into yer domicile! 03. Channeling that frontier spirit. North to the Future! 01. 120lb Uncoated “Arctic Slope White” ballistic poster stock. 02. “Alaskan Night Sky Navy,” “Alaskan Flag Star Yellow” and “Matanuska Glacier Blue” imprint. 03. A generous 18” x 24” in dimension. The right size. 04. Printed by the good people of Seizure Palace, Portland, Ore.
05. All the warts and moles. 06. “Way Limited Edition” of 150. 07. Each poster is hand-numbered, with trusted mathematics. 08. Free 3” x 26” burly kraft poster tube with each order!